Renault chose the Frankfurt motor show a few months back to reveal it's newest Megane RS, now they've also unveiled their plans for the hot hatchback. In keeping with tradition, there will be two versions available. The Cup, which is for the true racing enthusiast, and then the Sport chassis, which is still performance-oriented but relieves your kidneys ever so slightly with its softer setup. What's really exciting is the introduction of four-wheel-steering as standard on all performance models of the RS. Besides a tighter turning circle, it also makes the RS especially agile in tight turns as well as more stable at high speed. Thanks to Renault's participation in motorsport, the front and rear hydraulic compression stops provide additional damping and eliminate the effects of rebound, ensuring a high level of chassis efficiency regardless of the road quality, ultimately delivering a more comfortable ride. The PerfoHub suspension and steering setup from the previous generation has been improved with the suspension now stiffer than before. Also carried over is a limited slip differential on the Cup chassis. The Cup and Sport have individual suspension setups to cater for the different driver requirements. The all-new 1.8 Litre engine pushes impressive figures of 205 kW and 390 Nm of torque. Peak torque is available between 2 000 rpm and 5 400 rpm and claimed combined fuel consumption sits at 6.9L/100 km. The RS's facia is a sportier version of the futuristic and sophisticated fascia in the rest of the Megane family. 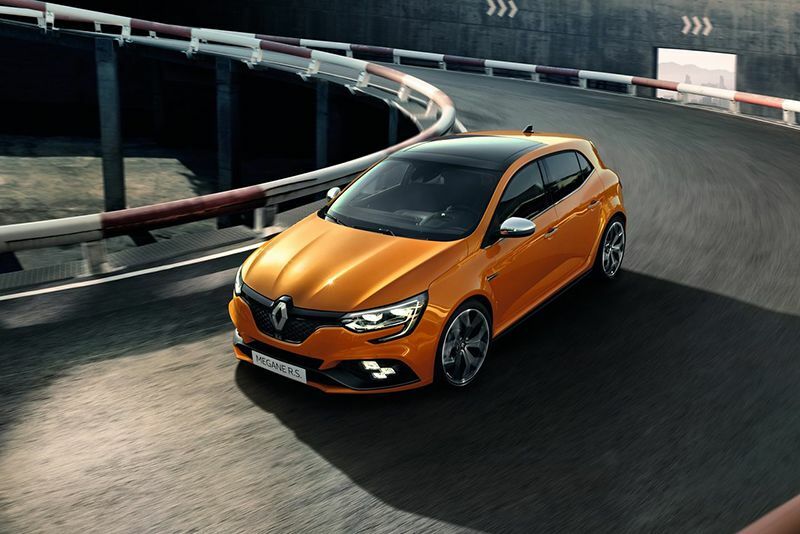 For the first time, the Megane RS offers either a 6-speed manual gearbox or a 6-speed EDC dual-clutch gearbox. The dual-clutch 'box features a multi-change down ability when the downshift paddle is held in as well as a launch control system. The Megane RS features a monitoring system that displays performance data such as G-forces, acceleration times, throttle and braking inputs and the like. But, that's not all! The system is now camera ready, so you can connect either a smartphone, GoPro, or certain regular cameras. Once you're set up, you can film yourself driving and, thanks to the performance data being embedded into the video, you can then analyse your laps to improve your times. Plus, you can even share the film on social media if that tickles your fancy. More good news, there will be a Trophy model before the end of 2018, with power figures around the 220 kW and 400 Nm mark. Video: Is The 2018 Renault Megane Rs The New Type R Slayer?